For Christmas last year, I decided to serve an Italian feast. That it was…although we ate two and a half hours late. But, in my family, that tends to happen. We did have plenty of wine and appetizers, so we enjoyed a lot of great family time together! 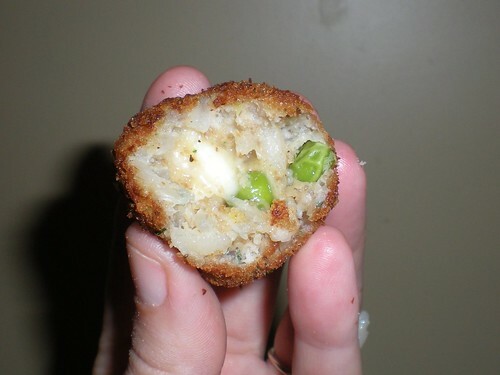 The Arancini, or Italian Rice Balls, were an absolute hit! I had enough leftover risotto to make another batch a few days later and threw them in a ziplock bag and into the freezer. We’ve been enjoying them for months since — just toss into the oven at 400 degrees for about 10 to 15 minutes and they’re just as delicious as the first time! Pour enough oil in a heavy large saucepan to reach the depth of 3 inches. Heat the oil over medium heat to 350 degrees F.
Stir the eggs, risotto, Parmesan, and 1/2 cup of the bread crumbs in a large bowl to combine. 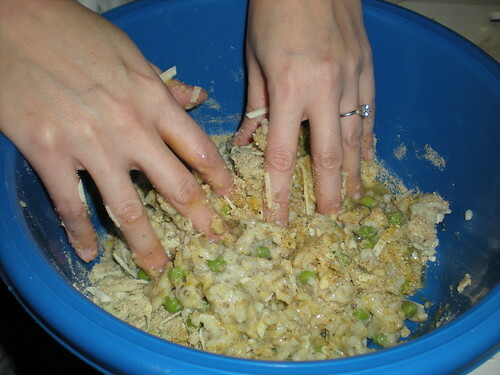 Place the remaining breadcrumbs in a medium bowl. 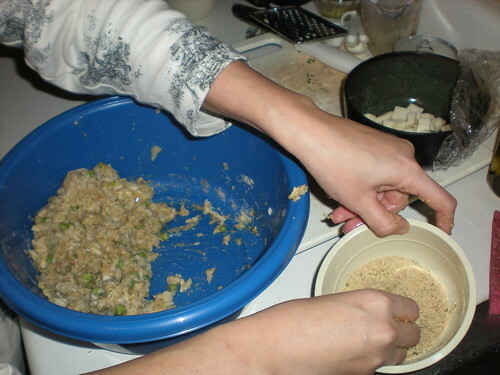 Using about 2 tablespoons of the risotto mixture for each, form the risotto mixture into 1 3/4-inch-diameter balls. Insert 1 cube of mozzarella into the center of each ball. Roll the balls in the bread crumbs to coat. Working in batches, add the rice balls to the hot ail and cook until brown and heated through, turning them as necessary, about 4 minutes. Using a slotted spoon, transfer the rice balls to paper towels to drain. Season with salt. Let rest 2 minutes. Serve hot. Bring the broth to a simmer in a heavy medium saucepan. Add the porcini mushrooms. 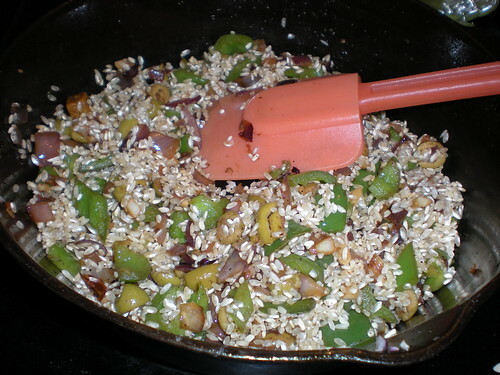 Set aside until the mushrooms are tender, about 5 minutes. Keep the broth warm over very low heat. Melt the butter in a heavy large saucepan over medium heat. Add olive oil. Add the onions and saute until tender, about 8 minutes. Add the white mushrooms and garlic. Using a slotted spoon, transfer the porcini mushrooms to a cutting board. Finely chop the mushrooms and add to the saucepan. Saute until the mushrooms are tender and the juices evaporate, about 5 minutes. Stir in the rice and let it toast for a few minutes. Add the wine; cook until the liquid is absorbed, stirring often, about 2 minutes. 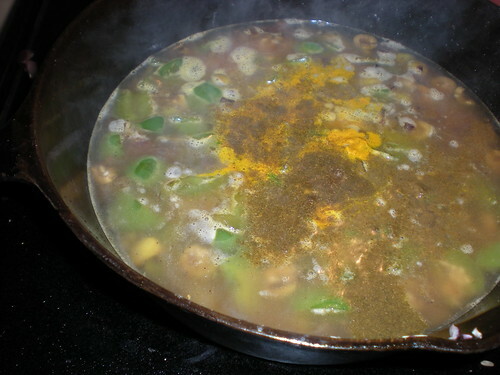 Add 1 cup of hot broth; simmer over medium-low heat until the liquid is absorbed, stirring often, about 3 minutes. Continue to cook until the rice is just tender and the mixture is creamy, adding more broth by cupfuls and stirring often, about 28 minutes (the rice will absorb 6 to 8 cups of broth). Stir in the peas. Mix in the Parmesan. Season with salt and pepper, to taste. I have prepared over a half a dozen recipes in the past few weeks, and everything has been outstanding. Seriously. These are blow your hair back kinda concoctions. 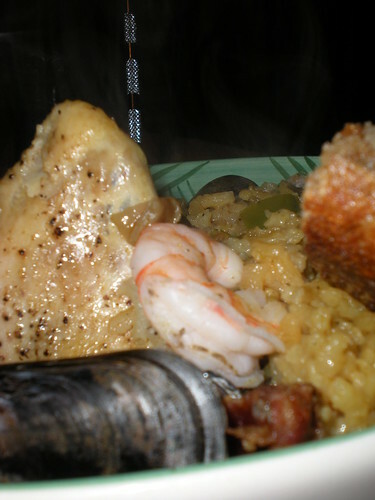 I had a taste for Paella about a month ago and stumbled upon this recipe. OMG. It’s soo good, I’ve already made it twice this month. I considered having a Spanish themed Thanksgiving so I could make it a third. 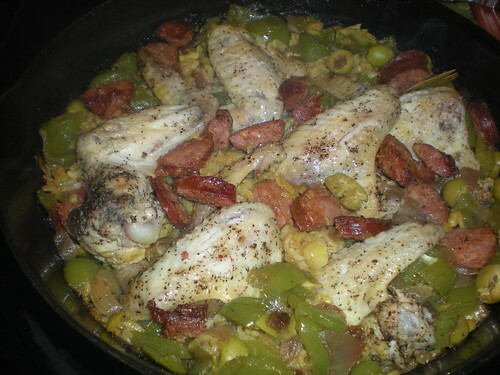 In a 12″ saute pan (or 18″ paella pan) add enough olive oil to cover the bottom. Put pan over medium to high heat. Season the chicken with salt and pepper. Add chicken to pan and sear both sides. Remove from heat and set aside. Place chorizo in pan and sear both sides. Remove from heat and set aside. Add onion to pan and cook until soft. 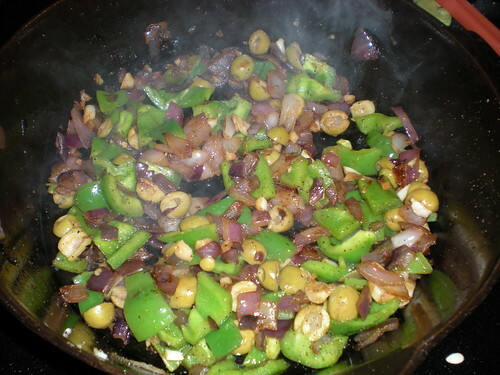 Add garlic, peppers and olives. Continue to saute for 5 – 10 minutes. Season with salt and pepper. Add cumin, saffron, bay leaves and thyme. Salt and pepper to taste. 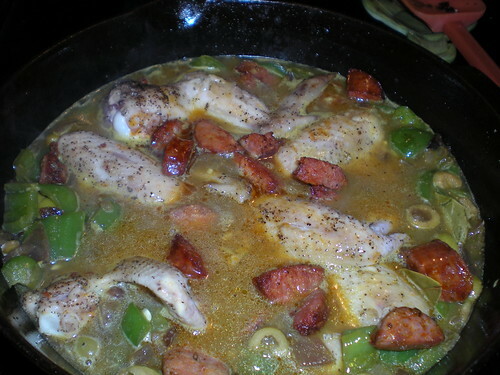 Add chicken and chorizo to pan. Arrange in decorative fashion. Cover with foil. Place pan in preheated oven. Cook for 45 minutes. 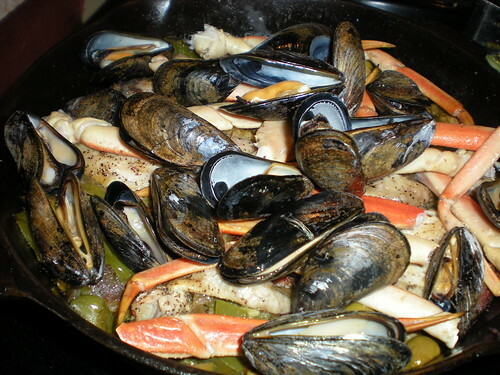 Add shrimp, mussels and crab legs and cook for an additional 10 minutes. Serve. Check out the original recipe here.